Content: Design, build and simulate complex robots using Robot Operating System and master its out-of-the-box functionalities. Description: The area of robotics is gaining huge momentum among corporate people, researchers, hobbyists, and students. The major challenge in robotics is its controlling software. The Robot Operating System (ROS) is a modular software platform to develop generic robotic applications. 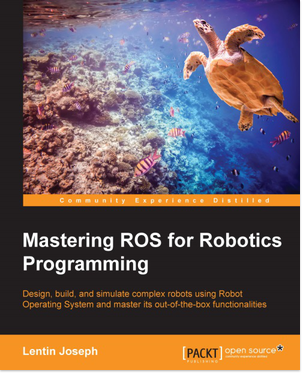 This book discusses the advanced concepts in robotics and how to program using ROS. It starts with a deep overview of the ROS framework, which will give you a clear idea of how ROS really works. During the course of the book, you will learn how to build models of complex robots, and simulate and interface the robot using the ROS MoveIt motion planning library and ROS navigation stacks. After discussing robot manipulation and navigation in robots, you will get to grips with the interfacing I/O boards, sensors, and actuators of ROS. One of the essential ingredients of robots are vision sensors, and an entire chapter is dedicated to the vision sensor, it's interfacing in ROS, and its programming. You will discuss the hardware interfacing and simulation of the complex robot to ROS and ROS-Industrial (Package used for interfacing industrial robots). Finally, you will get to know the best practices to follow when programming using ROS.